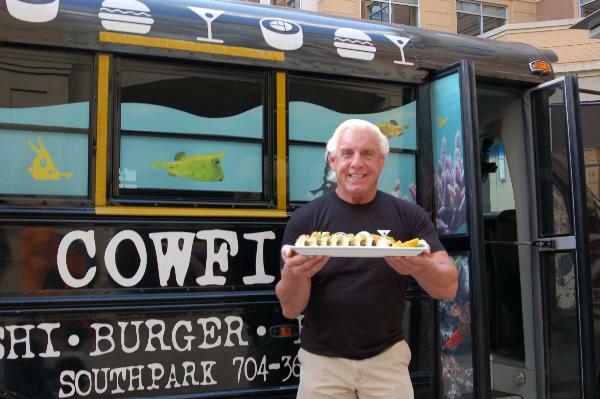 CHARLOTTE, N.C.  June 7, 2012  Two-time WWE Hall of Famer, 16 time World Heavyweight Champ, and Charlottes own, Ric Flair is going to the mat for the new Nature Boys WOOOOO-shi BuffalOOOOO-shi Roll at The Cowfish Sushi Burger Bar. A regular at the popular restaurant, Flair inspired Master Sushi Chef Rifali Almunir to craft the roll that will surely have sushi lovers shouting Flairs signature WOOOOO! The roll features chipotle bison, fried green tomatoes, grilled onions and feta cheese rolled in tempura flakes and topped with thinly sliced red onions and green tomatoes, drizzled with chipotle aioli and finished with thinly sliced jalapenos. The WOOOOO-shi BuffalOOOOOO-shi roll recently debuted on the The Cowfish menu. For the entire month of June, the restaurant will donate 10 percent of the proceeds to the Make-A-Wish Foundation Central and Western North Carolina. The Cowfish co-owner Alan Springate says, We love that Ric is in here as often as he is and wanted to do something fun for him. Teaming up with him to raise money makes it a win win for everyone. Co-owner Marcus Hall adds, From the moment we opened the doors its been a surreal experience having Ric as a friend of The Cowfish. I have been a fan since I was a kid, and to be able to work with him in any capacity is an honor. He is a one-of-a-kind legend who lights up the building when he strolls in. Always friendly, always The Man! We love having him on board for this great opportunity to help others. In addition to this being a great cause, his roll will blow you away! To borrow Rics line, You cant be the first, but you can be the next! Wooooooooooooooooooo!! !